Finally. I know that if I call this a white whale beer, a million neckbearded beer dorks will descend upon Kaedrin HQ with righteous fury, but it's been several years of near misses for me, so it was a hard fought victory for me. For those of you in the distribution range or who don't live in a state with archaic booze law (i.e. states that allow you to have beer shipped), you've got it easy. Well Deschutes distributes to Philly now (apparently one of the few east coast places that gets some Deschutes), so I've finally got my greedy paws on some of this stuff. Beer Nerd Details: 11% ABV bottled (22 oz waxed bomber). Drank of of a snifter on 1/18/14. Best After 08/16/14. Zuh? Best After 08/16/14? It turns out that it's just fine to drink fresh, but they claim it will age very well too, though it'll be "entirely different" a year on. So you're saying I need to hunt down another bottle? It looks like it. I could definitely see that bitterness mellowing out over time, and perhaps some of those other elements becoming better incorporated. Drie Fonteinen is one of the powerhouse lambic breweries, so this beer is something of a curiosity. It seems that famed master-blender Armand Debelder saw fit to branch out and try something only tangentially related to lambic. This is basically an English style porter beer that is brewed with wild yeast cultured from lambic casks. If this sounds like some sort of blasphemous experiment, well, it's not. Porter didn't always resemble what it does now. I'll leave the history to those who know better than I, but suffice to say that descriptions of 19th century porter tended to use words like: sour, tart, astringent, and acid. As Martyn Cornell notes in the linked post, these are not words you will find in the descriptions of porter in the latest Brewers Association beer style guidelines. To greatly simplify the possible reasons for this tartness, it seems to be attributable to both age and wild yeast infection (the combination of which are a virtuous circle, as wild yeasts do their thing over very large amounts of time). So basically, this beer isn't the lunacy that it might initially sound like. Indeed, I've seen various other breweries take on this concept of sour porter as well, though I can't really speak to historical accuracy for any of these beers. But forget about historical accuracy, do these suckers taste good? Let's give it a shot, eh? Beer Nerd Details: 7% ABV bottled (11.7 oz). Drank out of a tulip glass on 1/17/14. Beer Nerd Details: 12% ABV bottled (12 oz.) Drank out of a snifter on 1/11/13. The label sez they made this beer specifically to be aged in Bourbon barrels, and I do believe they've succeeded in that task. 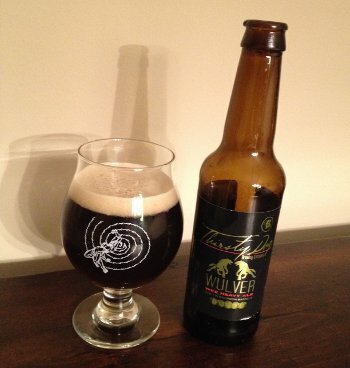 Now I'm going to have to keep an eye out for that BA Siberian Night, though wonder of wonders, Wulver seems to be the more highly praised of the two (normally the Imperial Stout is the more popular offering). Hey! I have an idea. Let's take Seizoen Bretta, a juicy funk machine that came out of nowhere and melted my face about a year ago, and age it on oak for a while. That sounds fun, right? Well it appears that David Logsdon had the same idea and went ahead and made some. Great minds think alike. And so do David and I! (Sorry David, but you walked into that one). Many thanks to Jay for sending this my way. Logsdon Oak Aged Bretta - Pours a hazy golden orange color with a couple fingers of fluffy but dense head that has good retention and leaves some lacing as I drink. The aroma is pure funk, some earthy notes, some farmhouse yeast spice, but a beautiful juicy fruitiness as well, and maybe a faint hint of that oak, but I'm really looking for it in the nose. The taste is also quite funky, lots of spice, a little earth, maybe even some pie-like crust flavors, and a big juicy fruit component, tart pineapple, with that oak appearing in the middle and finish. 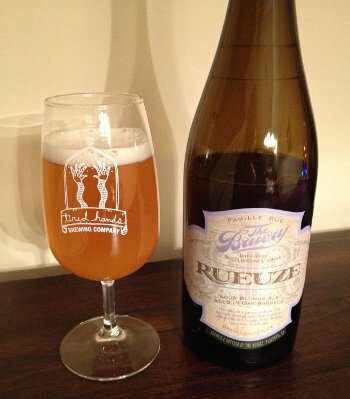 Mouthfeel is dry, highly carbonated, effervescent, and crisp, maybe a hint of pleasant acidity too. Overall, this is a superb funky saison, complex and delicious. Easily the equal of regular Seizoen Bretta, though I don't know if it's better. But we're still talking about an A grade here, so that's just splitting hairs. Beer Nerd Details: 8% ABV bottled (750 ml capped and beeswax dipped). Drank out of a tulip glass on 1/10/13. So I seem to have exhausted Logsdon's Seizoen program, but they've got a few others that sound promising (and some that will probably be a bear to acquire). And quite frankly, I'd hit up any of these Seizoens on a semi-regular basis if they distributed out here. What beer to drink on New Years Eve? I've typically fallen on a big, effervescent saison for this task, but the true answer to this conundrum is the Champagne of Beer: Miller High Life. Unfortunately, I was fresh out, so I had to settle for an American imitation of a Gueuze (which is the actual Champagne of Beer, for the record). I've mentioned a few times recently that brewing is not an activity for the impatient, and these Bruery folks certainly seem to have a lot of foresight and patience in developing their Barrel Aging program. Beer Nerd Details: 5.6% ABV bottled (750 ml capped). Drank out of a flute glass on 12/31/13. 2013 Vintage. Solid stuff. I'm a bit behind on my Bruery beers, so you'll probably see a few new ones pop up in the coming month or two, including one that appears to use the same oak aged sour blonde ale base (though this other one is fruited). The other is Mash, a bourbon barrel aged barleywine (truly a beer after my heart). It has been far too long since I've written about our friends in Downingtown, PA. Victory's staple IPA, HopDevil, will always hold a special place in my heart, as it was probably the first beer that really got me to love hops. Sure, I'd had other pale ales before and thought they were fine, but HopDevil got me to love those citrus hops and bitter finish. Flash forward a decade later, and their line of IPAs was starting to feel a bit stale. HopDevil is still a staple beer and a sight for sore eyes at a lot of local non-craft focused establishments, and I really enjoy the occasional Hop Wallop, but I get the impression that Victory started to see their sales plateau despite the generally skyrocketing sales of IPAs overall. 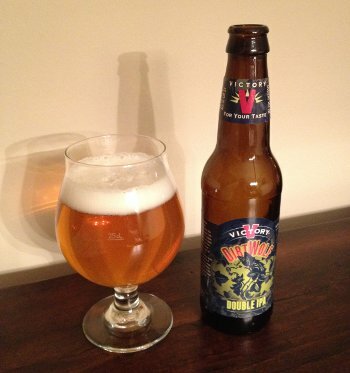 Perhaps as a result, Victory slowly started fiddling with hops at their brewpub. In 2009 or 2010, they did a line of single hop pale ales called the Pursuit series. 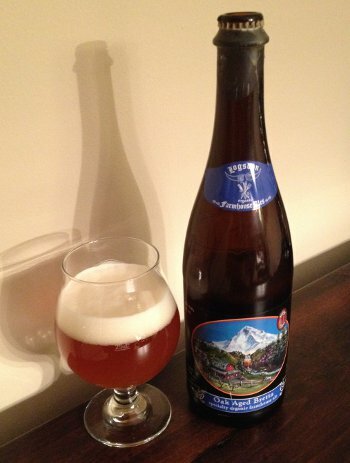 I had one of these by chance and wasn't a huge fan, but clearly the experimental aspect of the series was a success, because it culminated in Headwaters Pale Ale, which is a fantastic yet simple take on the lowly pale ale style (it's also a huge seller and may even have surpassed HopDevil to become Victory's flagship). In 2011, they started playing with Double IPAs and worked with their contacts at hop farms to create the Ranch series (a name which seems to inspire visions of ranch dressing in all who hear it, but it's actually a reference to the hop ranches that victory sources from). This kicked off with Ranch S, which was Cascade single hopped (and which I quite enjoyed), then Ranch R, which was Centennial single hopped (and which I didn't like as much). Things proceeded from there, with other single hop beers (Chinook, Simcoe, Citra, etc... most of which I did not have) and then some hop combos (Philly Beer Week saw a Simcoe and Amarillo combination that was really quite nice). The Ranch series eventually culminated in Dirt Wolf, which uses Citra, Chinook, Simcoe and Mosaic hops. It's also one of the beers I'll review later in this post (sorry for taking so long to get to the point). Now, to make matters more confusing, in the summer of 2013, there was a short offshoot of the Ranch series that had a lighter bodied malt bill and utilized a cleaner yeast strain. The first of these was called K-Bomb and it used an experimental hop known as ADHA 483 (it has since been named Azacca). It was quite nice! 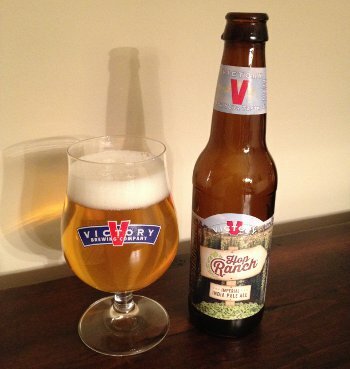 For Philly Beer Week, Victory evolved that recipe to include Mosaic hops as well, and called it Liberty Bell Ringer and that was a very well received beer. So Victory took that recipe, made some minor tweaks, and just released it in December as Hop Ranch (even though it doesn't really taste like any of the Ranch beers). Beer Nerd Details: 9% ABV bottled (12 oz.) Drank out of a tulip glass on 1/4/13. Enjoy by May 19, 2014. Beer Nerd Details: 8.7% ABV bottled (12 oz.) Drank out of a tulip glass 1/4/13. Enjoy by May 18, 2014. I've heard very good things about these Netherlanders and even had some good first hand experience with their stuff, so when I saw this Imperial Stout aged in Jack Daniels barrels sitting on the shelf (it was a bit of an oddity, as this bottle was right next to some more Imperial Stout, but with a slightly different label - it took me a few moments before I noticed the little "Jack Daniels Barrel Aged" sticker on the side of the label), I figured it was worth a stretch. Emelisse has actually done a series of IRS beers, all with different hop or barrel treatments under their "White Label" banner, but this one seems like its own thing. I'm actually surprised we don't see more Jack Daniels barrel treatments out there in the beer world, as it's the most popular American whiskey brand and I believe it has the same secondary market of bourbon barrels... On the other hand, I didn't love this beer. 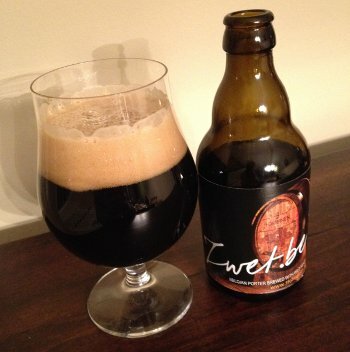 Its not bad at all, but when it comes to BA stouts, its got a lot of competition! Beer Nerd Details: 11% ABV bottled (11.2 oz.) Drank out of a snifter on 12/27/13. Bottled 03/2013, Lot A. Another orbital period has passed, which I guess means I need to reflect on the year that was or some such thing. Since I'm terrible at choosing favorites and because it's a totally arbitrary exercise, I'll be posting my top 40 beers of the year. That might seem like a lot, but then, I could probably do a top 40 Tired Hands beer list and still have 60 of their brews that didn't make the cut (I'm pretty sure this is not an exaggeration; they put up at least 1-2 new beers a week on average and I've kept up pretty well). I drink too much is what I'm saying. Trading - It continues, and a fair amount of beers on the list below came from trades, LIFs, and BIFs, but not nearly as much as you might think. It turns out that Philly is a pretty great beer town, asinine PLCB rules notwithstanding, and even the suburbs are getting in on the action these days. I doubt I'll ever reach the crazy 5 trades per month tempo that some beer dorks engage in, but I'm pretty happy with the 5-6 trades I engage in per year, and I got to try some great stuff this year because of that. Wales, bro - White Whale beers are a sorta moving target. When you start to dip your toes into beer nerdery, anything popular that is rare and/or isn't distributed near you is a whale. Stuff like KBS. Then you start ticking those top 100 beers that are hard to find, but the goalposts move to obscure vintages of absurdly limited beers (I've had approximately 1 beer on that list) and people start creatively misspelling whales as walez or wales and at that point, who cares? The hunt can be fun, but some of that stuff seems like a fool's errand. I'll probably stick with local wales and trade for some khaki wales if the mood strikes me. With stuff like Operation Cheddar an finally procuring some Cantillon, I've gotten pretty good at scoring some great stuff, and that's all I can really ask for. The year the ratings died, sorta - I've been doing this for three years now, and I'm experiencing some serious ratings shifting here. Stuff I'd have rated an A a few years ago might be a B level beer nowadays. Is this changing tastes? Or was I just plain wrong? Or maybe I'm just drinking such a higher caliber of beer now that it puts that older stuff in a different perspective? Probably all of the above. So take my ratings with a grain of salt. I'm a moron. Snobby Palate - I'll never claim to have a great palate, but I'm starting to get super snobby about fresh IPAs in particular. And bars that don't clean their tap lines are starting to annoy me. And I'm pretty sensitive to carbonation issues. I don't know how great this development really is, but I try not to annoy other people with my snobby palate and pedantry. Sessionable Beer and Redrinking Beer - I used to basically never drink the same beer twice. And I used to review nearly every beer I drank. But that's lame. I've definitely drank a bunch of beers I've already sampled this year. 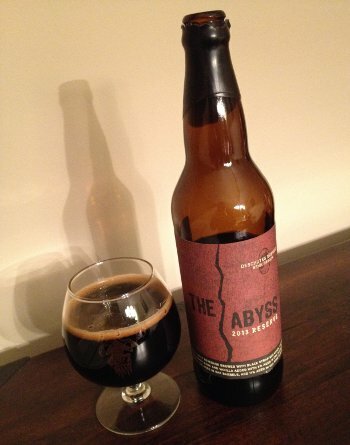 Some are massive face melters that have a limited annual release (oh, hello there Parabola! ), but I've also found a desire for "regular" beer or even a session beer. Sure, I still drink an unhealthy amount of high ABV stuff and the list below certainly contains ample Imperial Stouts and Barleywines, but sometimes I want to sit down with something normal, like a 4% pale ale. Not everything has to melt my face, all the time. Home Brewing - A slow start to the year, but I've been on a tear of late. I've also been tackling "slow" beers, stuff that takes a while to actually finish off (like, for example, the Brett dosed saison or bourbon oak aged imperial stout), but in about a month, I should have about 3 batches hitting their prime. Poor timing, perhaps, but still. I've also finally procured a kegerator and have kegged my first beer (Red Heady), so we'll see what that does (I'm actually planning to keep a relatively sessionable beer on at all times, but we'll see). As per usual, I've got lots of plans and ideas, so it should be a fun year. Aging/Cellaring Beer - I spent a pretty big portion of the year trying to drink down my cellar rather than going out and procuring the next big thing. Of course, I still buy way too much beer, but most of it is not really for aging, even if, uh, it takes me a while to get to it. There are definitely some beers that have really worked for me after a couple years in the cellar, but most are better fresh. This tends to be the general accepted wisdom in the beer nerd world, but it's interesting to discover it for yourself. Damn, that was more difficult than I thought. There are at least, like, 5 other Tired Hands IPAs that could easily replace the one I put in there, not to mention stuff like Guillemot Nebula or even the Rye Barrel Only void. I had a great year in beer. Here's to a great 2014! Yet another Bourbon County variant, this one is new this year, though it appears to share a certain kinship with variants of years past (for example, last year's Cherry Rye). It looks to be the same base stout, but instead of Bourbon barrels, they use Templeton Rye barrels, and then they add in a 50 pound dose of puréed mulberries, marionberries, and boysenberries to each barrel. According to the Chicago Reader, 200 barrels were filled (which, while still a lot of beer, is significantly less than the 1400+ barrels used for regular BCBS). 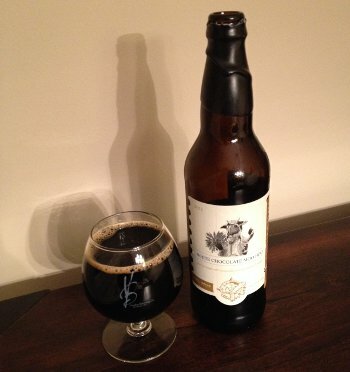 So what I'm saying here is that this should not only have berry notes, but it will also taste more rare than regular BCBS (and maybe slightly more rare than BCBCS). And we all know how good "rare" tastes, right? Beer Nerd Details: 12% ABV bottled (22 oz. bomber). Drank out of a snifter on 12/25/13. Bottled 20NOV13 0757. 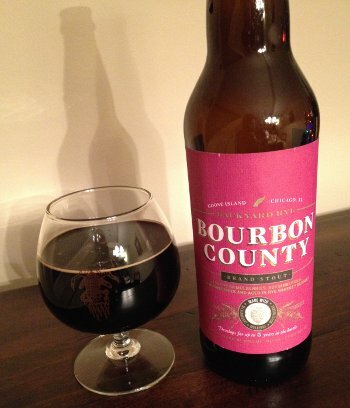 So my favorite Bourbon County beer remains the original, straight up BCBS. Of the variants, my favorite was the Barleywine, but only because I'm not a big coffee guy - if I were, that explosive coffee character in this year's fresh BCBCS would knock my socks off. Backyard Rye is certainly a fine beer and I'd never in a million years turn it down, but expectations were perhaps too high here. There are some other variants floating around this year, but they're Chicago-only brews that I'm unlikely to try (which is a shame, as Coconut Rye sounds like it could be up my alley, and it seems to be pretty popular). So I've got a nice stash of Bourbon County beers that will hopefully last me the rest of the year, though at this point, I believe I've reviewed them all. Posting will continue to be light this week, again for obvious reasons. Have a great (and safe) New Years everyone! 'tis the season for beer gifts. I arrived at work the other day to literally, like, 5 bottles of beer on my desk. Gotta love my coworkers (and of course I reciprocated said gifts)! Later in the day, I participated in the office White Elephant and ended up with another six pack (I didn't steal it and swear I didn't pick it thinking it was beer). Incidentally, my contribution to the white elephant was a 40 of Olde English (with a gift card tucked into the bag). It got stolen once, and the guy who stole it didn't even know about the gift card. Score. Beer Nerd Details: 6.1% ABV bottled (22 oz. bomber). Drank out of a snifter on 12/21/13. Posting will probably be light this week, for obvious reasons. Merry Christmas to those of you who are celebrating this week!